This post turned out ramblier than expected. Sorry about that: it seems to be happening more and more lately. My forum posts tend to be a bit more coherent. Alright, let’s present some more evidence for evolution: in this case, the evidence that Darwin used to convince his peers. Back in the 19th century, there was a very sparse fossil record, no understanding of genetics, and organisms changing over time hadn’t even been observed, yet Evolution still had enough evidence behind it to convince the scientific community and smack down the existing dominant theory (Intelligent Design: 150 years out of date). What made up the shortfall in other areas, and what Darwin spent much of his book outlining, was biogeography: the relationship between biological life forms and the area’s they inhabit. Explorers were in vogue at the time, so there was a lot of data available on the distribution of various types of creatures across the globe, and of course Darwin got the chance to witness it first hand in the form of the Galapagos finches (Dude spent 7 years of his life studying oysters, but somehow it’s the few weeks watching finches that everyone remembers him for). What Darwin noted was the fact that, as geological separation increased, so did biological separation. The animals close to each other would be more similar than the animals separated by hundreds of miles. Animals separated by water or desert or mountain ranges would diverge even more extremely. Australia’s marsupials are the boring textbook example of this, and everyone’s heard that one before, so to mix things up let’s go for a more interesting and complicated example. Besides, small furry mammals are overrated: there are equally adorable creatures amongst the other families. Who’s an adorable blind fishy? You are! Yes you are! Some fairly recent DNA analysis determined that the closest relative of a species of blind Australian cave fish isn’t another type of Australian cave fish at all: it’s a species of (equally blind) cave fish found in Madagascar, on the opposite side of the indian ocean. At first glance, this hardly seems like evidence for evolution: quite the opposite, in fact. These fish aren’t built for travelling: swimming across the Indian ocean isn’t a simple proposition when you’re less than 10cm long and blind, not to mention adapted for freshwater. So how do two closely-related species of effectively-immobile organisms end up on opposite sides of the ocean? That’s where geography comes in: specifically, plate tectonics. I assume we’re all familiar with Gondwanaland, the supercontinent that split apart in the cretaceous? As you can see by this map, Australia and Madagascar were connected by Antarctica, implying that the common ancestor of these fish lived at least 100 million years ago. This matches up with a load of other biological evidence for the Gondwanaland split: the few marsupials that survived the rise of placental mammals outside Australia are all on other subcontinents of Gondwanaland, the Jurrasic-era dinosaur species that lived in South America are identical to those in Africa and Antarctica. On a less charismatic scale the pattern still holds true: all of Madagascar’s freshwater fish groups, exhibit relationship patterns related to the breakup of Gondwana (some are related to groups in India/Sri Lanka, and others to groups in Australia) including our cave fish. It’s this culmination of evidence that makes Evolution such a certain thing, but also makes it so hard to convince denialists of its veracity. The evidence for evolution often can’t be summed up with soundbytes or images: with moon-landing denialists you can show off photos from the lunar reconnaissance orbiter, with cryptozoologists you can point out that the requirement for a stable population means at least 100 sasquatch individuals wandering the mountains. There’s very little like this for evolution, because the evidence is strongest when taken next to all the other evidence, giving denialists an easy out: by picking holes in a single element at a time, they never have to confront the overwhelming mountains of evidence behind them. HERV’s are one of the most concise and definative arguments for evolution I’ve found, and even they depend on a pattern, rather than an instance. Fossils like Archae and Tiktaalik help, but are also easy to dismiss: “there are no transitional fossils” makes for a better soundbite than “the term is misleading since all fossils are transitional to one extent or another, but several fossils display transitional features including…”. I haven’t modelled paedomorphosis or peramorphosis at all! Crap! I’ll have to completely start over from scratch! Evidence. Been a while since I did a post on this topic. Trashing IDist arguments doesn’t count. Lots of words have been used to describe the evidence in favour of evolution, and they range from “mountainous” to “non-existent” depending on whether you’re listening to biologists or dentists (no offence to the many wonderful, rational dentists out there, especially the ones who are putting braces on my teeth this Thursday. [cowers]). There’s also some rather extreme variety in the contributing fields: everything from molecular and genetic studies to palaeontology and geology to physical and behavioural studies of living creatures. I should remind myself to write more on this subject in the future. But the most compelling line of evidence for common descent as a whole isn’t anything in particular. I can go on until the cows come home and start eating the furniture and generally stinking up the place about how fossils and molecules and physiology and taxonomy and radiology and retroviruses and genetics and reality make evolution denialism about as rational as believing that Elvis is still alive, and he faked his death to elope with Bigfoot to the high mountains of Nepal, where they live with the 17th re-incarnation of the Dalai Lama, who came back in time to convince the Great God Thor to grant Van Halen immortality so he could follow in Aerosmith’s footsteps and save the world from the Mayan islamosocialist zombie apocalypse in Dec 2012. And it’s all Obama’s fault for faking the Kenyan moon landing. True story. Anyway, where was I? I could go on about all the individual lines of evidence until [insert ridiculous hypothetical here], but the most compelling evidence isn’t any of these on their own: it’s all of them together. 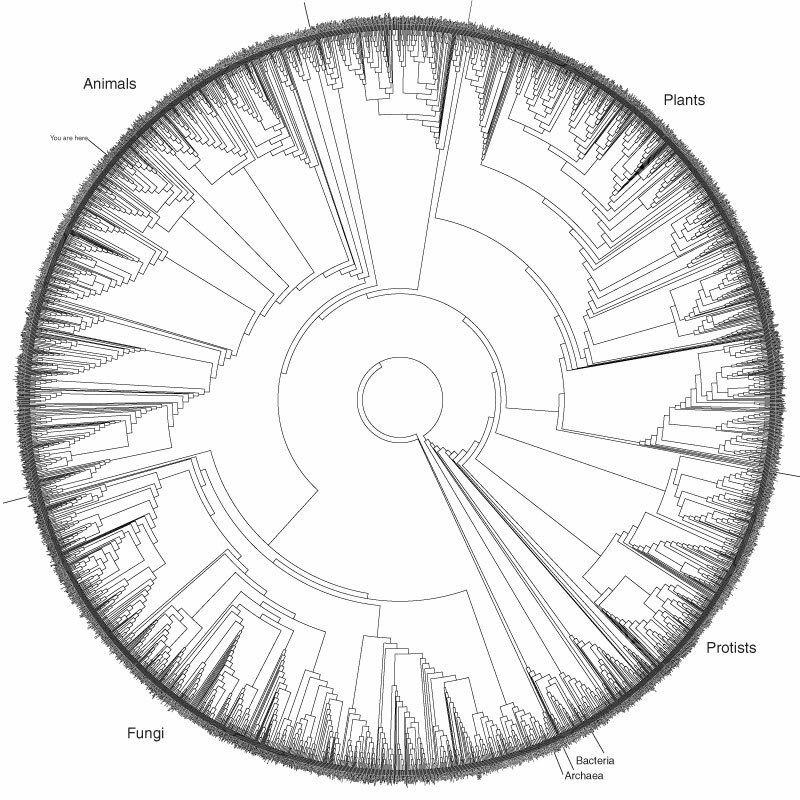 It’s the nested hierarchy, also known as the Tree of Life, itself. You see, a major prediction of common descent is that it inevitably forms a nested hierarchy. Due to the random nature of mutations, and the immense variety of “everything that is biologically possible”, it’s practically impossible to achieve the same thing in exactly the same way twice. What this means is that an identical feature in two separate species, whether it be molecular, physical, skeletal or behavioural, is a strong indicator of common descent. If a third species doesn’t share the same feature as the first two species, then that indicates its common ancestor is earlier on the timeline. 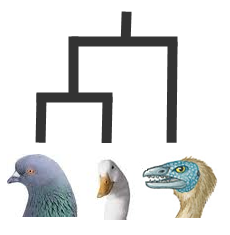 So… say two animals have very similar keratin beaks, while a third animal does not. According to the theory, it’s a fair bet that the two beaked animals are more closely related, and share a more recent common ancestor, than either of them do with the beakless wonder. For the record, evidence is a fine thing and should always be demanded when unfounded assumptions are expressed as facts. However, in this particular case, I am not making an assumption: I am stating a logical prediction of the theory. If the theory is right, this prediction will be true. If the prediction isn’t true, the theory isn’t right. And if the theory is wrong and we really were spoken into existence by God/deposited by aliens/travelled here from another dimension/sneezed out by the great green Arkleseisure, then the prediction has no reason to be true. And if the prediction is right… okay, I’ll stop being redundant. You get the idea. This all leads us quite elegantly (or it would, if I had any elegance at all) to the question: is the prediction true? How do we check that our beaked creatures do in fact share a more recent common ancestor than they do with the third, un-beaked creature? With living creatures you can do this with all their genes as well, as well as a huge variety of physical and behavioural features, and rather than comparing two or three creatures, you can do it with ALL OF THEM: every organism on the planet, including the fossilised ones. That’s hundreds of thousands of traits being compared across billions of species: not a shoddy test by anyone’s standards, and certainly not the dismissive hand-wave anti-evolutionists love to characterise evolutionary science as. All it would take is one feature, on one Species, that doesn’t fit this graph: a mammal with avian feathers, a classic style minotaur or a chimera or a mermaid or a Pegasus (pegasii? pegaseuss? ), or maybe Ray Comforts famously mockable crocoduck… and the entire edifice shakes, and the discoverer get’s worldwide recognition. Yet we’ve never, ever, found creatures like that except in myth and legend. Even with the massive amount of biodiversity on earth, every species living or dead we’ve ever discovered fits into and confirms this one graph: sometimes it has to be turned around a bit first because convergent evolution often has a few surprises lying in wait in the long grass, but it always fits. Every bloody time. That is why evolution denialism is not just a matter of religious opinion, or of interpreting the same evidence differently. Denying that mutation and natural selection are the source of biodiversity on earth is like denying that gravities influence on matter is the source of planets orbiting the sun. I have never seen any other hypothesis or theory that explains the prevalence of the Nested Hierarchy across every species and in every feature of biological physiology. “Common designer” can only hand wave so much. crocoduck, Elvis/Sasquatch? I think I read that fanfic., Nested Heirachy, Tree of Life, Why dentists? What is up with that? Now, we all know about chromosomes: they’re the things in our cells which hold our genes. Now, all the great apes have 24 pairs of chromosomes. This is fair enough, but (according to evolution) we are just as closely related to the great apes as they are to each other. So we should also have 24 pairs of chromosomes, correct? But we don’t. Human beings only have 23 chromosome pairs. Now, this isn’t a massive deal: chromosomal counts differ greatly within genus, and sometimes even within species. The plant genus Clarkia, for example, has species with chromosome counts of n = 5, 6, 7, 8, 9, 12, 14, 17, 18, and 26 (Lewis 1993). But chromosomes don’t just disappear: when they do, the victim of the mutation is missing a good quantity of, usually important, DNA. So what happened to the 24th human chromosome? With everything I’ve just told you, a logical prediction can be made: at some point in our ancestry, but not in the ancestry of other great apes, two chromosomes must have joined. This isn’t a harmful mutation: the gene’s themselves are still viable, but they are now part of a single chromosome, not two. Now, chromosomes have easily recognisable sequences at the ends, called telomeres, and another recognisable type of sequence in the centre called centromeres (0). 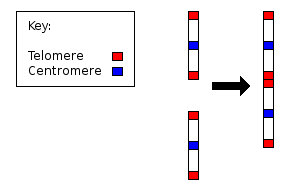 Centromere’s are where the chromosome divides during reproduction. So, geneticists realised that if humans really are descended from apes, one of their chromosomes should have two (X’s) in the middle of it, with a pair of (0’s) flanking them. Keep in mind that if this isn’t found, common ancestry with apes is in big trouble: after all, how else could we lose a chromosome without it screwing us up? Here’s a abstract representation of Human Chromosome Number 2, as discovered by geneticists who went looking for this pattern as a direct result of the theory of evolution. No big surprise there if you accept the theory of evolution, but it is a pretty nice piece of evidence nonetheless: easy to understand and rather difficult to refute. If you take a look at the attempts of anti-evolutionist groups like Answers In Genesis (here), you’ll notice they never even try to explain HC2, instead simply asserting it’s not evidence for evolution and then throwing out red herrings and going off on strange tangents about information content. The closest they come to an explanation is a half-hearted admittal that maybe humans and apes were created with the same number of chromosomes. Hooray for ad hoc reasoning, I guess? I’ll let you judge which explanation is more satisfying. This one I learned from the Dover v Kitzmiller Intelligent Design Trial Transcripts. Kudo’s to Ken Miller, who presented it during the trial. And apologies to the noble geneticists whose work I am simplifying (butchering would perhaps be a better term) to make this point. Please don’t send your armies of genespliced insect-men after me. Send the insect-men! He still thinks I’m on his side, but he’s gone too far this time. The truth is, he’s just stalling for time to finish building his [OBSCURED BY PERCEPTION NANITES] and I can’t stand by any longer. Those poor porpoises! A large number of virus’s reproduce by converting a host cell into a miniture virus factory, to force the host to produce more viruses before it dies. There are several ways of achieving this, but a Retrovirus does it by inserting a section of it’s own DNA into the genetic code of the host cell. 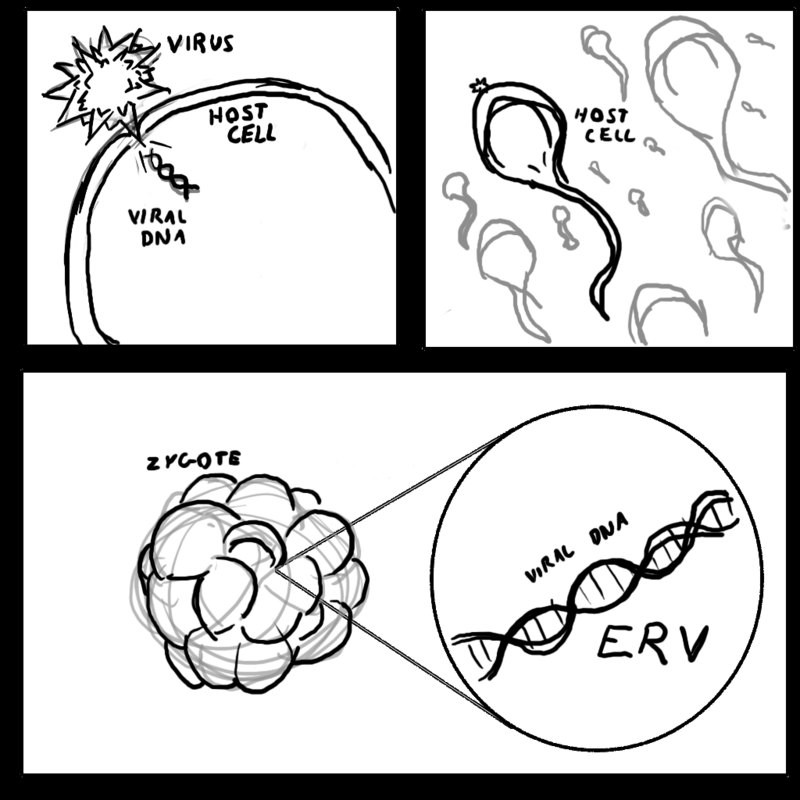 The host cell then runs the retrovirus DNA using it’s own molecular machinery, building more viruses and continuing the virus life-cycle. Normally, that segment of virus DNA dies with the cell, which generally doesn’t take very long since a cell is not specifically equipped to manufacture viruses. But sometimes the cell attacked is a reproductive cell, such as a sperm or egg. Now this doesn’t help it at all, unless it goes on to fertilise another reproductive cell and create a creature. That creature will grow up with the viruses DNA, now deactivated, floating around somewhere inside it’s own DNA. This bit of code is an “endogenous retrovirus”, or ERV: virus DNA inside the genetic structure of a non-virus creature. And if the creature survives to reproduce, and it’s descendants survive to reproduce, eventually that little bit of inactive virus DNA will be found everywhere in the breeding population. So, keeping in mind that we know what causes ERV’s, we know what they do and how they get put into our DNA, we can compare ERV’s between creatures. If a creature shares an ERV with another creature, than they either share a common ancestor who was “infected” by the ERV, or the exact same type of retrovirus (there are thousands) infected two seperate species in the exact same location in their genetic code. We share at least eleven ERV’s with both chimps and gorilla’s. If we’re not related to both, then the same type of retrovirus infected all three species in the same location, 11 seperate times. That’s rather persistant for a co-incidence. It get’s better. Of those 11, 9 ERV’s are shared with orangutans as well. And 7 are shared with gibbons, 4 with old world monkeys, and 2 with new world monkeys. This step-wise structure confirms, in spectacular fashion, the tree diagram we’ve already come to expect from other lines of evidence. We’re more closely related to chimps than orangutans, orangutans than monkeys, etc. I’ve yet to see any anti-evolutionist provide any answer to the mind-boggling number of co-incidences that would be needed to produce this pattern of ERV’s: a quick search of AiG’s website or Creation.com shows the usual response “but they’re not junk! lots of them do something!”. In other words: “Look over there, a distraction!” We don’t care that they do something, we care that we know how they get in and that they confirm the same tree of life we see everywhere in biology. We, and all animals, do not share any ERV’s with more distantly-related creatures that we don’t also share with more closely-related creatures: exactly what the ToE predicts. We know why and how ERV’s are put into the genetic sequence: we’ve observed it happening. We know what they do, or rather, what they don’t do anymore (regardless of whether or not they’ve been repurposed by the host creature since then). And we know that they form a pattern that confirms and agrees with the nested heirachy that is the Tree of Life. That’s a result that would be spectacularly improbable in a creationist or other anti-evolutionist paradigm that doesn’t require common ancestry. Of course, if there’s an explanation out there that doesn’t involve evolution, we’re all ears. 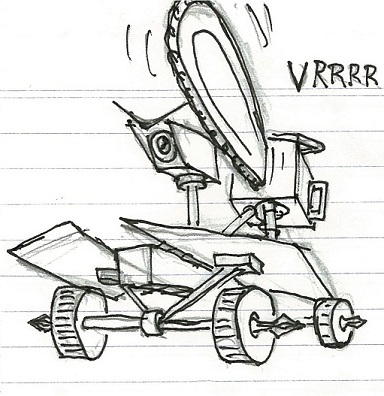 Fun fact: this blog isn’t only about Game Development! Who knew? So that’s why specifics are called for. Observations explained elegantly by the standard model, predictions based on it that turned out to be true, contradictions that cannot be reconciled by any other extant hypothesis or theory. They’re not rare, but they can be hard to extract from the mass of technical vocabulary written by scientists who don’t rate yet another piece of evidence for evolution very highly. The scientists already know about the ridiculously huge mountain of data they are simply adding to. Proving an already-proved theory doesn’t really excite them. But with so much misinformation, quote-mining, selective-reporting, false-claims, hoaxes, wilful ignorance and, when all else fails, blatant lying out there, on the internet and in real life, such observations do excite me. Mostly because I’m kinda egotistical and I like being right. So I’ll pick and choose some of the more interesting items here and there to discuss, to add a bit of variety to this blog and maybe to stir up a bit of trouble. What does he mean “kinda”? You are currently browsing the archives for the Evidence category.